Cities: Capital: Maseru (173,700). Other cities — Leribe (35,000), Mafeteng (32,900), Teyateyaneng (22,800), Mohale's Hoek (18,400). Nationality: Noun: Mosotho (sing. ); Basotho (pl.). Adjective — Basotho. Population (2010 est., World Bank): 2,084,182. Religions: 90% Christian, including Roman Catholic (majority), Lesotho Evangelical, Anglican, other denominations; other religions include Islam, Hindu, indigenous. Languages: Official: Sesotho and English. Other — Xhosa, Zulu. Education: Years compulsory: 7 (ages 6-13). Lesotho has free primary education (grades 1-7). Literacy (2011 est., CIA) — 86%. Health: Infant mortality rate (2011 est., CIA World Factbook) — 55.04/1,000. Life expectancy (2011 est., World Bank) — 45 years. Work force (2007 est. ): 854,600. Branches: Executive: monarch is head of state; prime minister is head of government and cabinet. Legislative — bicameral parliament consists of elected Assembly and non-elected Senate. Judicial — High Court, Court of Appeals, Magistrate's Court, traditional and customary courts. Political parties: Lesotho Congress for Democracy (LCD), All Basotho Convention (ABC), Basotho National Party (BNP), Lesotho Peoples Congress (LPC), National Independent Party (NIP), Basutoland African Congress (BAC), Basutoland Congress Party (BCP), Lesotho Workers Party (LWP), Popular Front for Democracy (PFD), Marematlou Freedom Party (MFP), Christian Democratic Party (CDP), Kopanang Basotho Party (KBP), National Progressive Party (NPP), New Lesotho's Freedom Party (NLFP), Sefate Democratic Union (SDU), Social Democratic Party (SDP), United Party (UP), Basotho Democratic National Party (BDNP), Basotho Batho Democratic Party (BBDP), Lesotho Educational Party (LEP), National Democratic Party (NDP), and Senkatana Party (SP), All Democratic Corporation (ADC). Central government budget (2010 est. ): Revenues — $968.4 million. Expenditures — $1.193 billion. GDP (2010 est., World Bank): $2.1 billion. Annual growth rate (2010 est., CIA World Factbook): 2.4%. Per capita GDP (2010 est., World Bank): $1,080. Average inflation rate (2010 est. ): 6.1%. Agriculture (2010 est. ): 7.1% of GDP. Products — corn, wheat, sorghum, pulses, barley, peas, beans, mushrooms, wool, mohair, livestock. Arable land — 11%. Industry (2010 est. ): 34.6% of GDP. Types — textiles, apparel assembly, food, beverages, handicrafts, construction, tourism. Trade (2010 est. ): Exports: $985 million. Types — clothing, furniture, footwear, live animals, and wool. Partners — South Africa, United States, Botswana, Swaziland, Namibia, EU, Madagascar. Imports (2010 est.) — $1.766 billion. Types — food, clothing, building materials, vehicles, machinery, medicines, petroleum products. Partners — South Africa, Asia, India, EU. Economic aid received (2008): $306 million. Primary donors — U.S., World Bank, IMF, EU, UN, U.K., and Ireland. 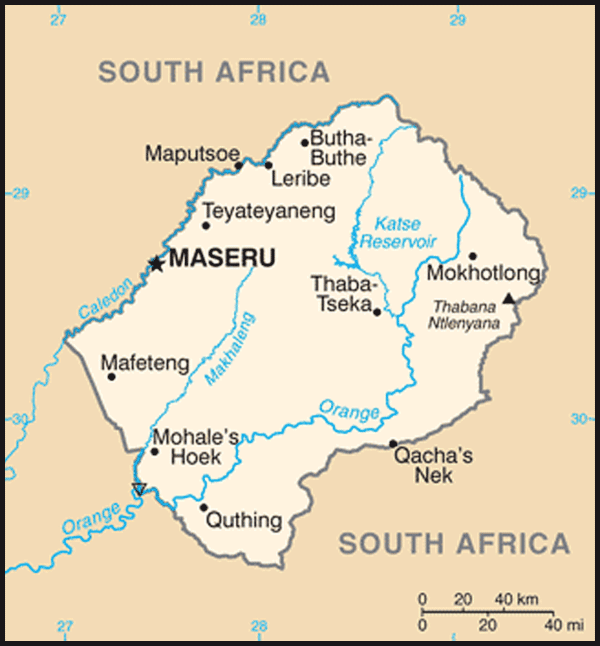 More than 99% of Lesotho's population is ethnically Basotho; other ethnic groups include Europeans, Asians, and Xhosa. The country's population is 90% Christian, the majority of whom are Roman Catholic. Other religions are Islam, Hindu, and indigenous beliefs. Sesotho and English are official languages, and other languages spoken include Xhosa. Prime Minister Ntsu Mokhehle formed a new party, the Lesotho Congress for Democracy (LCD), and was followed by a majority of members of parliament (MPs), which enabled him to form a new government. The LCD won the general elections in 1998 under the leadership of Pakalitha Mosisili, who had succeeded Mokhehle as party leader. Despite the elections being pronounced free and fair by local and international observers and a subsequent special commission appointed by SADC, the opposition political parties rejected the results. An Interim Political Authority (IPA), charged with reviewing the electoral structure in the country, was created in December 1998. The IPA devised a proportional electoral system to ensure that there would be opposition in the National Assembly. The new system retained the existing 80 elected Assembly seats, but added 40 seats to be filled on a proportional basis. Elections were held under this new system in May 2002, and the LCD won again. However, for the first time, due to the inclusion of proportional seats, opposition political parties won significant numbers of seats. The February 2007 elections resulted in another LCD victory. While acknowledging the LCD victory, opposition parties continued to assert that some of the proportional seats were allocated incorrectly. Nine parties hold all 40 of the proportional seats. The National Independent Party (NIP) formed an "informal alliance" with the LCD, leading to its share of 21, the largest of any minority party. The LCD has 63 (following the floor-crossing of an ABC member of parliament in March 2009) of the 80 constituency-based seats, and the All Basotho Convention (ABC) holds 15 after another MP broke away to form his own political party in December 2008. The 2007 elections remained an active point of contention for years. Opposition parties called for the reallocation of seats, revision of the electoral law, and formal designation of a leader of opposition. The Christian Council of Lesotho (CCL) began mediating the conflict in 2009. Little progress was made until early 2011. In a major breakthrough, the CCL, with the assistance of an expert facilitated by the UN Development Program (UNDP), held a meeting in which all parties agreed on the amendments to be made to the proposed electoral bill. All parties also agreed to use a single-ballot system in future elections, eliminating the possibility of the contentious informal alliances of 2007. The next general elections are scheduled for February or March 2012. On April 22, 2009, a failed assassination attempt was made on Prime Minister Mosisili at his residence. Two suspects were arrested in Lesotho, and seven suspects were arrested in South Africa. Those seven were handed over to Lesotho authorities on April 19, 2011, following a prolonged extradition process. The suspected mastermind and financier of the attempted coup is in South Africa awaiting his extradition process. Another chief suspect of the investigation, former bodyguard of opposition leader Tom Thabane, Makotoko Lerotholi, died in South Africa on October 16, 2009, before the completion of the extradition process. The suspects are on trial, facing charges of murder, attempted murder, robbery, kidnapping, illegal possession of firearms, contravention of the Internal Security Act of Lesotho, and conspiracy to kill the Prime Minister. The Lesotho Congress for Democracy (LCD) controls a majority in the National Assembly (the lower house of parliament), with All Basotho Convention (ABC), the National Independent Party, and the Lesotho Workers Party among the 11 opposition parties represented. The upper house of parliament, called the Senate, is composed of 22 principal chiefs whose membership is hereditary, and 11 appointees of the King, acting on the advice of the Prime Minister. Lesotho held its first post-independence local government elections in 2005 using a quota system that reserved one-third of electoral divisions for women candidates. In these elections, 53% of the victorious candidates were women. Locally elected officials attended post-election training while regulations for local governance were drawn up by the National Assembly and infrastructure was created. Originally scheduled for May 2010, the next local government elections are set for October 2011. A dispute between the LCD and opposition parties over the method of allocating one-third of seats for women led to repeated delays. Lesotho's economy is based on water and electricity sold to South Africa, manufacturing, earnings from the Southern African Customs Union (SACU), agriculture, livestock, and to some extent, earnings of laborers employed in South Africa. Lesotho also exports diamonds, wool, and mohair. 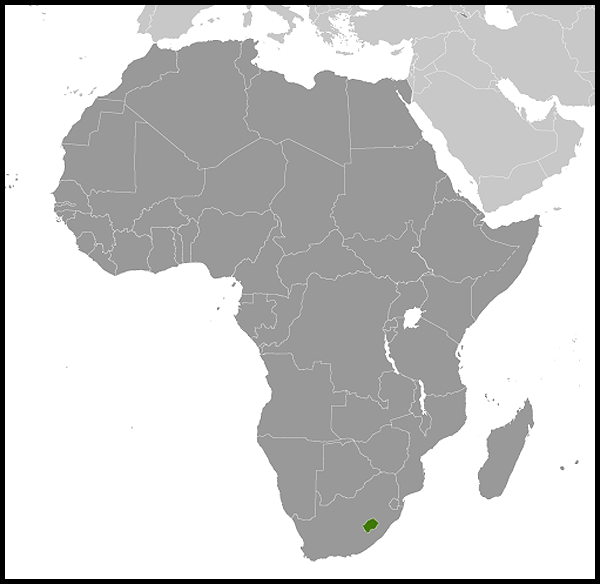 Lesotho is geographically surrounded by South Africa and economically integrated with it as well. The western lowlands form the main agricultural zone. The majority of households subsist on farming or migrant labor, and almost 50% of the population earns some income through crop cultivation or animal husbandry. In 2010, agriculture accounted for an estimated 7.1% of GDP. Water is Lesotho's only significant natural resource. It is being exploited through the 30-year, multi-billion-dollar Lesotho Highlands Water Project (LHWP), which was initiated in 1986. The LHWP is designed to capture, store, and transfer water from the Orange River system and send it to South Africa's Free State Province and greater Johannesburg area, which features a large concentration of South African industry, population, and agriculture. Completion of the first phase of the project has made Lesotho almost completely self-sufficient in the production of electricity and generated approximately $24 million annually from the sale of electricity and water to South Africa. The World Bank, African Development Bank, European Investment Bank, and many other bilateral donors financed the project. Lesotho has taken advantage of the African Growth and Opportunity Act (AGOA) to become a major exporter of garments to the U.S. from sub-Saharan Africa. Exports to the U.S. under AGOA totaled $280 million in 2010, and the sector employs approximately 40,000 workers. Taiwanese and Indian investors own most factories. Lesotho has nearly 7,000 kilometers of unpaved and modern all-weather roads. There is a short rail line (freight) linking the capital city of Maseru with Bloemfontein, South Africa that is owned and operated by South Africa (the half-mile trunk inside Lesotho is operated by Lesotho Flour Mills, Ltd.). Lesotho is a member of the Southern African Customs Union (SACU) in which tariffs have been eliminated on the trade of goods with other member countries, which include Botswana, Namibia, South Africa, and Swaziland. With the exception of Botswana, these countries also form a common currency and exchange control area known as the Common Monetary Area (CMA). 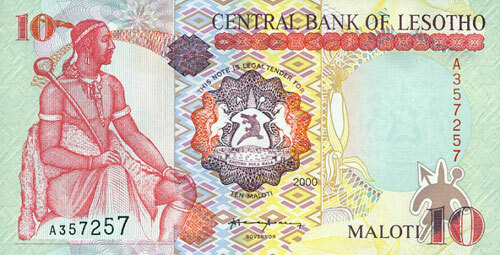 The South African rand can be used interchangeably with the loti, the Lesotho currency (plural: maloti). One hundred lisente equal one loti. The loti is at par with the rand. According to recent estimates, the HIV/AIDS prevalence rate in Lesotho is 23%, the third-highest in the world. According to the Lesotho Bureau of Statistics, in 2006 life expectancy was estimated at 39.7 for men and 42.9 for women. In 1999, the government finalized its National Strategic Plan on HIV/AIDS, a diagram for addressing the education, prevention, counseling, and treatment needs of the populace. In 2000, Lesotho declared a national emergency as a result of the HIV/AIDS crisis. In 2003 the Government of Lesotho hosted a SADC Extraordinary Summit on HIV/AIDS. In 2005 legislation was passed to create the National AIDS Commission to coordinate society-wide anti-AIDS activities, which was followed by the launching of a national "Know Your Status" campaign aimed at achieving 100% testing and counseling of all Basotho. A partnership framework that is aligned with the National Strategic Plan was signed in August 2009 by the U.S. President's Emergency Plan for AIDS Relief (PEPFAR) and the Government of Lesotho. The donor community is collaborating with the Government of Lesotho in a massive effort to address the HIV epidemic. Key international stakeholders include PEPFAR, UN agencies, Irish AID, other international donors, and dozens of non-governmental organizations. The security force is composed of the Lesotho Defense Force (LDF — estimated 5,000 personnel) and the Lesotho Mounted Police Service (LMPS — estimated 3,000-4,000 personnel). The LDF consists of an army and an air wing. The LDF reports to the Prime Minister (who is the Minister of Defense and National Security), while the Lesotho Mounted Police Service reports to the Minister of Home Affairs. There also is a National Security Service (NSS) for intelligence, which is directly accountable to the Prime Minister. Relations between the police and the army have occasionally been tense, and in 1997 the army was called upon to put down a serious police mutiny. The situation was defused, relations have since normalized, and the two institutions cooperate as necessary. Lesotho's geographic location makes it extremely vulnerable to political and economic developments in South Africa. It is a member of many regional economic organizations including the Southern African Development Community (SADC) and the Southern African Customs Union (SACU). Lesotho also is active in the United Nations, the African Union, the Nonaligned Movement, the Commonwealth, and many other international organizations. In addition to the United States, South Africa, China, Libya, Ireland, and the European Union all currently retain resident diplomatic missions in Lesotho. The United Nations is represented by a resident mission as well, including UNDP, UNICEF, WHO, FAO, WFP, and UNAIDS. Lesotho has historically maintained generally close ties with the United States, European Union member states, and other Western countries. Although Lesotho decided in 1990 to break relations with the People's Republic of China (P.R.C.) 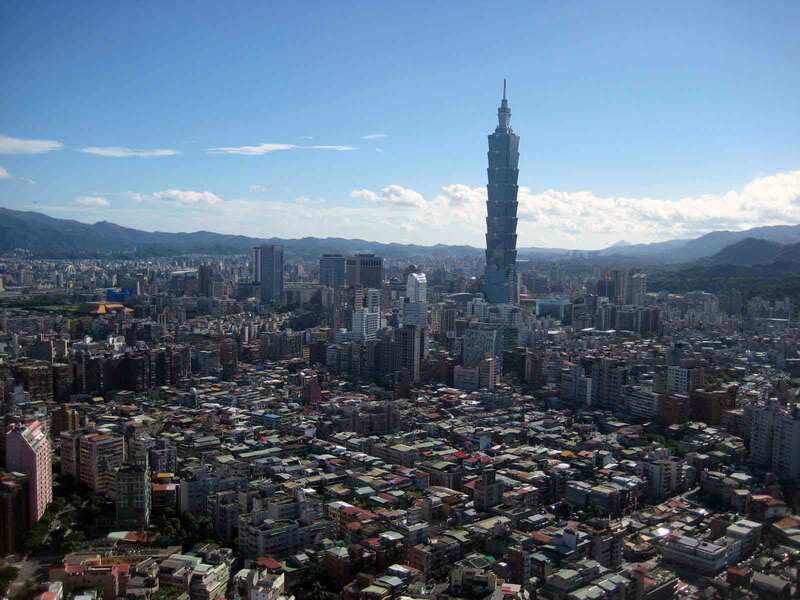 and reestablish relations with Taiwan, in 1993 the nation restored ties with the P.R.C. Lesotho also recognizes Palestine as a state, was a strong public supporter of the end of apartheid in South Africa, and granted a number of South African refugees political asylum during the apartheid era. The United States was one of the first four countries to establish an embassy in Maseru after Lesotho gained its independence from Great Britain in 1966. Since that time, Lesotho and the United States have consistently maintained productive bilateral relations. In 1996, the United States closed its resident bilateral aid program in Lesotho. In 2007, however, the Government of Lesotho signed a compact with the Millennium Challenge Corporation to provide $362.5 million in support over the next 5 years to develop Lesotho's water, healthcare infrastructure, and private sector. An in-country program to support PEPFAR was established in 2005 and also includes representatives of the U.S. Agency for International Development (USAID) and the Centers for Disease Control. The Peace Corps has operated in Lesotho since 1966. About 60 Peace Corps volunteers concentrate in the sectors of health, agriculture, education, rural community development, and the environment. The Government of Lesotho encourages greater American participation in commercial life and welcomes interest from potential U.S. investors and suppliers. The mailing address of the U.S. Embassy (http://maseru.usembassy.gov/) is P.O. Box 333, Maseru 100, Lesotho. Tel: (266) 22-312-666; fax: (266) 22-310-116. E-mail: infomaseru@state.gov (infomaseru@state.gov).